The earliest written evidence of cats in Japan indicates that they arrived from China or Korea at least one thousand years ago. For hundreds of years bobtailed cats were highly valued and guarded. In 1602 Japanese authorities decreed that all cats should be set free to cope with vermin threatening the silkworms. Buying or selling cats was forbidden, and from that time forward bobtailed cats lived on farms and in the streets. Thus Japanese Bobtails are the "street cats" of Japan. They were first brought to the United States by American servicemen, who had acquired them as pets overseas. The Bobtails attracted the attention of American cat breeders, who imported the first breeding stock to the United States from Japan in the 1960s. 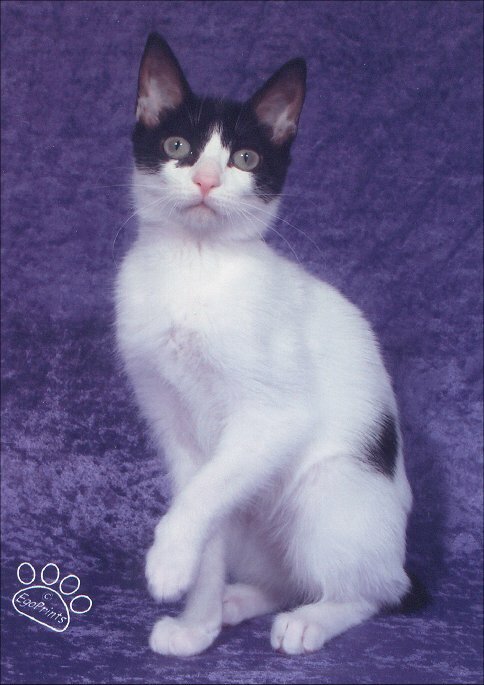 Japanese Bobtails were granted Provisional Breed status in 1971, and achieved Full Championship status in CFA in 1976. The Japanese Bobtail is a natural breed and does indeed come from Japan; all CFA registered cats can be traced back to the original imports. The Japanese Bobtail has existed in Japan for many centuries. It is featured in many ancient stories, art prints and paintings, and to this day is considered good luck to have in the house. When visiting Japanese shops, you will often see a ceramic "maneki neko" (beckoning cat) near the front door with one paw raised. This traditional symbol of welcome and good luck is a stylized rendition of the much-cherished Japanese Bobtail cat. The maneki neko figurine is most frequently seen in Japanese shop windows or by doorways offering hospitality and good fortune to all who enter, and good business to the owner. Large or small, made in a variety of materials from papier mache to fine porcelain, most are adorned with neck ribbons with attached bells. Some have their right paw raised, some their left. The maneki neko is the traditional symbol which heralds the Japanese Bobtail, its fine ancestry, and good fortune. The Japanese Bobtail is a medium sized cat, well muscled but straight and slender rather than massive in build. The unique short tail resembles a bunny tail with the hair fanning out to create a pompom appearance which camouflages the underlying bone structure. The head is triangular in shape. The high cheekbones and unique set of the large eyes lend a distinctive Japanese cast to the face. Cats with two different eye colors (odd-eyed) or with blue eyes are quite desirable. The Japanese Bobtail is active, energetic and very affectionate. Their outgoing and loving temperament make them excellent pets. They are very intelligent and active cats, and retain their kittenish playfulness into adulthood. They travel well, and adjust easily to life with dogs and other cats. They are very adaptable and are especially good with children. Japanese Bobtails are strong and healthy cats. They are active, intelligent, talkative cats. Their soft voices are capable of nearly a whole scale of tones; some people say they sing. Since they adore human companionship they almost always speak when spoken to. They are not related to the Manx in any way, each breed being completely different in head and body types. 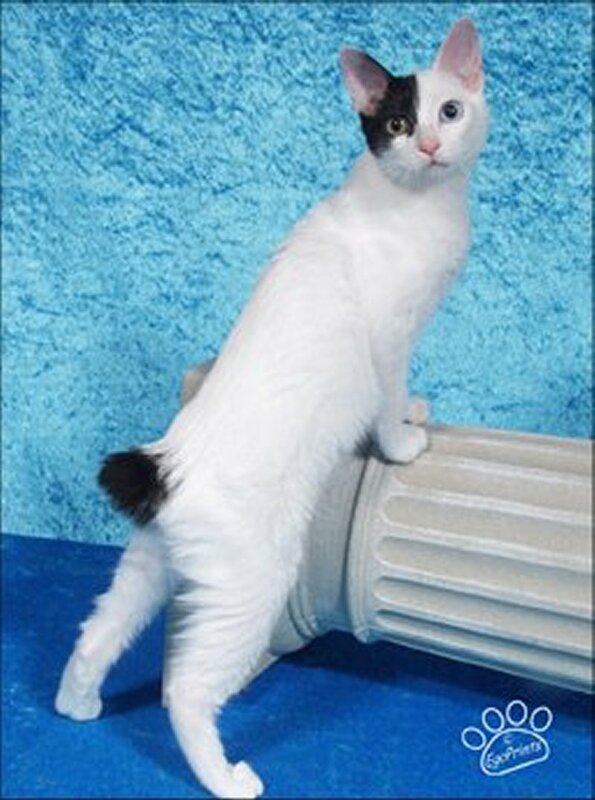 The genetic factor that creates the Japanese Bobtail is not related to the genes which make the Manx cat tailless. The tail is unique not only to the breed, but to each individual cat. Like our finger prints, no two tails are ever alike. The tail must be clearly visible and is composed of one or more curves, angles, or kinks or any combination thereof. The furthest extension of the tail bone from the body should be no longer than three inches. The direction in which the tail is carried is not important. The tail may be flexible or rigid and should be of a size and shape that harmonizes with the rest of the cat. The structure of the tail is camouflaged by the tail hair, which fluffs out to resemble a pompom. The shorthair Japanese Bobtail has a soft and silky coat of medium length which appears flat rather than fluffy, giving it the look of porcelain. Longhaired Japanese Bobtails have belly shag and definite britches on the hind legs. The tail leaves no doubt as to whether the cat is a shorthair or longhair, the tail hairs being much longer on the longhair cats. The Japanese Bobtail comes in almost every color. The most popular color is the mi-ke, pronounced "mee-kay", a Japanese term meaning "three-furred" or what we would call calico. It refers to a predominantly white cat with bold patches of red and black.